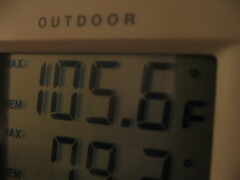 As you can see in the photo, my home thermometer recorded a maximum outdoor temperature of 105.6°F (about 41°C) today. Walking around outside felt like baking in an oven, or like being back in Manila. More from CapitalWeather. I got a 101.9 today on the north facing wall of a covered porch.